MAKAR is honored to be performing in the New York City Marathon on Sunday, November 4, 2018 again, starting at 10:35 am. We will be singing and playing our hearts out, cheering on the runners on the corner of 11th St and 48th Ave, in Long Island City, Queens!!!!! the view from long island city! 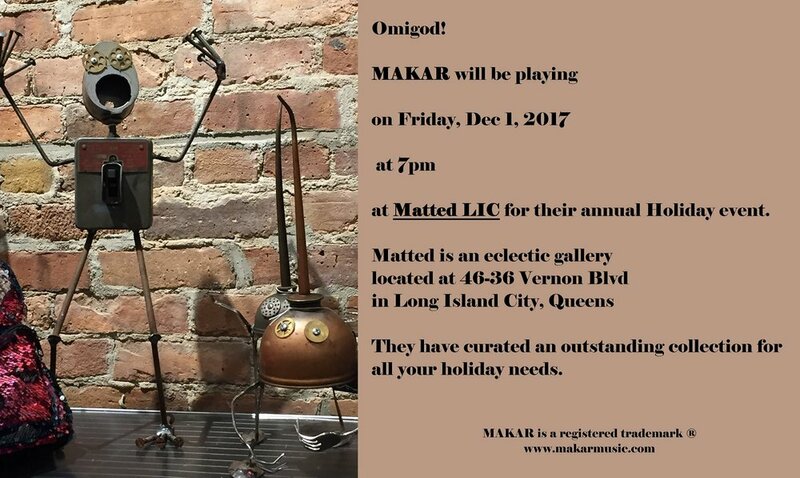 MAKAR will be playing on Friday, Dec 1 at 7pm at Matted LIC for their annual Holiday event. Matted LIC is an eclectic gallery located at 46-36 Vernon Blvd in Long Island City Queens. The Vernon Blvd stop on 7 train is the nearest subway. They have curated an outstanding collection for all your holiday needs. Did we mention that this event is free? b/t Broome St. & Delancey St.
MAKAR has this cool gig in Williamsburg Brooklyn at St. Paul’s Theater on Wednesday, May 27th at 7 pm. They will be joining forces with the women storytellers of the Workers Justice Project. Subway Service: one block from the Marcy J, M, Z stop, a 7 minute walk from the Broadway G stop, and a 10 minute walk from the Lorimer L/Metropolitan G stop. Bus Service: B60, Q54, and B46 all stop within a block. This event free but they are taking donations for the Workers Justice Project. It will be an evening of storytelling, music and art. There will be stories by the women of the Workers Justice Project - Proyecto Justicia Laboral, whose mission is to is to empower low-wage immigrant workers to gain a voice in the workplace and build strong and economically sustainable communities through education, organizing, leadership development, and the growth of grassroots economic alternatives. Along with three 15-20 minute sets by yours truly MAKAR. MAKAR is Andrea’s band with her husband Mark Purnell.